Prime Minister Shri Narendra Modi is in Jakarta for an official visit to the Republic of Indonesia (May 29-31) at the invitation of H.E. Mr. Joko Widodo, President of the Republic of Indonesia. His visit was eagerly awaited by the Indian diaspora in Indonesia. A number of Indians in Indonesia enthusiastically awaited the arrival of PM Modi at the Hotel Ritz-Carlton, Mega Kuningan. 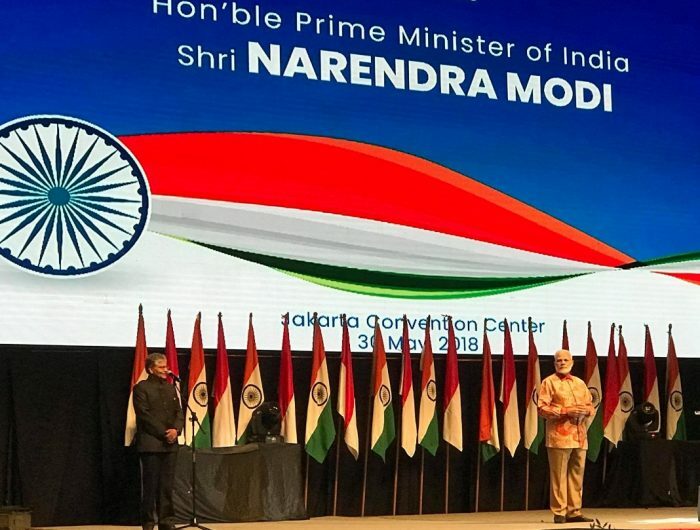 The INDIA limousine with Indian and Indonesian flags arrived at the hotel, and as PM Modi alighted from the car, he heard the cheering from the waiting on the left hand side of the entrance. Instead of walking into the hotel, he walked towards the crowds where he shook hands with all. It was a wonderful first impression of this charismatic leader in Indonesia. Prime Minister’s official engagements in Jakarta and Singapore include bilateral meetings with the leadership, delegation level talks, meetings with the business and Indian communities. In honor of Honorable Prime Minister of India Narendra Modi, India Club is hosted a large community gathering on Wednesday, the 30th of May 2018, for the Indian Diaspora and friends of India were invited. This Public Interaction was from 3pm to 6pm and venue shall be Plenary Hall, Jakarta Convention Center (JCC), Senayan, Jakarta with over 3500 people in attendance. Padma Shri Kailash Kher, Indian music composer and Sufi singer, wowed the crowd with his energetic music as a prelude to Modi’s speech. A message of friendship and cooperation between the two nations.